You’ve probably heard a lot of fuss about mechanical keyboards lately, and if not, you’ve at least heard the clicking coming from a nearby desk. If you’re curious to try one yourself without dropping a bunch of money, VAVA’s new model, which has sold between $80-100 in the month since it launched, is cheaper than ever today. You won’t get brand-name Cherry MX key switches at this price, but the switches it does include should closely mimic Cherry MX Blues, which are the loudest, most tactile switches out there; I use them myself. But the headlining feature here is the keyboard’s fully customizable RGB backlighting, the likes of which we rarely see in a keyboard under $100. Google Wifi is one of the highest-profile competitors in the nascent mesh router market, and Amazon’s taking $20 off a three-pack of routers today. Granted, that’s not a huge discount (especially with this similar TP-Link system on sale for $200), but it’s the first real deal we’ve seen since Black Friday. Amazon is having a sale on a crazy amount of luggage, carryons, and more for the whole family, from brands like TravelPro, Delsey, and Traveler’s Choice. So, if you’ve been using that duffel bag since college and you have a flight to catch soon, you should get on this one. Like any Gold Box, these prices are taking off at the end of the day. You’ve probably been running outside for a few weeks now, but if you were looking for an excuse to pick up new running shoes, here it is. Amazon is marking down four styles (two men’s and two women’s) of Saucony running shoes to $60. But you’d better pick up the pace, because these prices only last for today. A first-aid kit is one of those things you should probably keep in your glove box, and you should definitely have at home, and at $12 for 299 pieces, there’s no excuse not to be prepared for minor accidents. It includes bandages, gauze, medicines, an instant cold pack, and more, all tucked away in a refillable soft bag. You can thank us later. If you’re lucky enough to own a Nintendo Switch, you’d damn well better take good care of it. 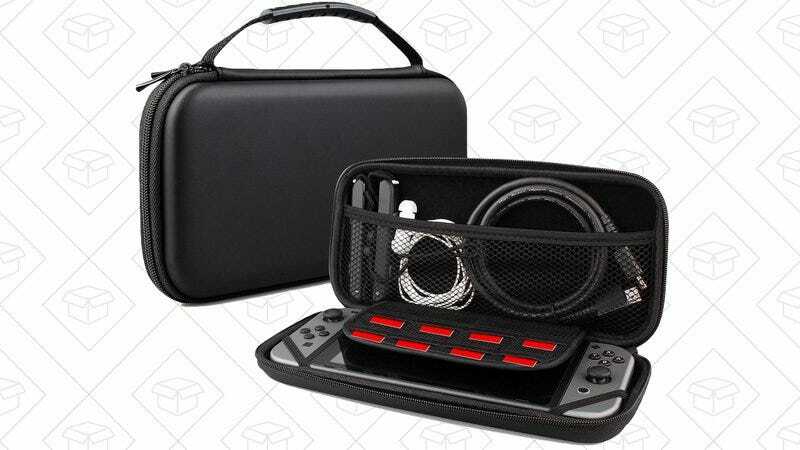 This $8 hard-shell case (with promo code 9C9GSQEP) will keep it safe while it rattles around in your bag, and its built-in pockets will hold your accessories and game cartridges, too. For the rest of tody’s best deals, be sure to head over to Kinja Deals.